One of the first “fancy” vacations my husband and I ever took fancy meaning a bit higher end than a getaway to Walt Disney World or a rustic cabin in Maine was to Hawaii for our 12th anniversary in 2006. We opted for a cruise around the islands so we could get an introduction to Oahu, the Big Island, Kauai, and Maui. We had just started to dip our toes into the miles and points pool back then. We only had enough loyalty “currency” for one coach airline ticket on Continental (now merged with United) and an overnight pre-cruise stay at the Waikiki Beach Marriott Resort in Honolulu. Saving money, even in this small way, was a kick and I don’t think I ever dreamed wed return to Hawaii again and again and again using miles and points. In 2009 we received some fantastic news. My mother-in-law, who had been battling cancer, got the all clear from her doctor! We decided there was no better way to celebrate the occasion than by taking my husband’s family to Maui. During the previous holiday season Delta had run a terrific promotion in which they awarded bonus SkyMiles (150% of the original transaction amount) for certain purchases its customers made with partner hotels and rental car companies, affiliated credit cards, and online stores via Delta’s online shopping portal. I had gone “all in” on that promotion and was rewarded with thousands of bonus miles. I redeemed those miles along with my existing Delta SkyMiles balance for five coach tickets to Maui. It helped that we booked three tickets on one flight and two on another route. Getting five award tickets on any one flight can be quite a challenge. This summer we were back in Maui again this time with my family for a reunion. My husband and I used our American Airlines AAdvantage accounts to redeem two first class airline tickets to Maui. Sitting up front with a bit more legroom makes a huge difference when flying that long-haul route from the East Coast. 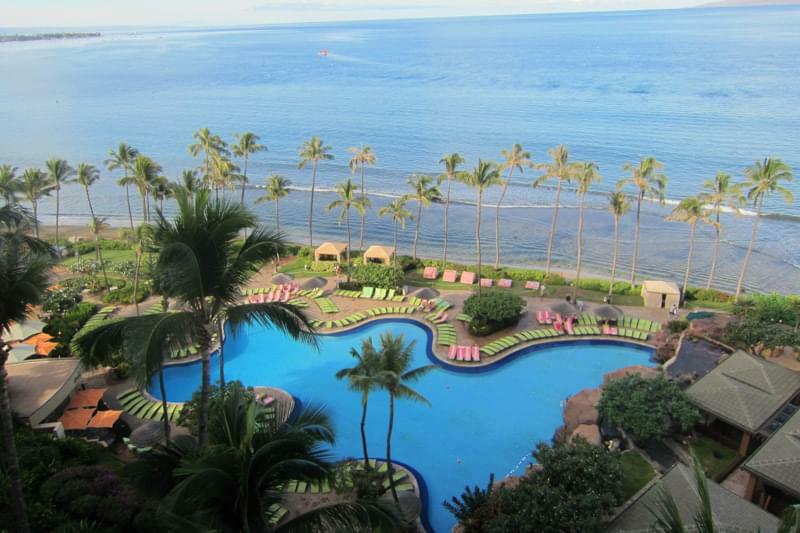 Our group booked five rooms at the Hyatt Regency Maui, which offers one of the best values in the hotel points game. A room there costs 22,000 Hyatt Gold Passport points, or 27,000 points for a room with access to the Regency Club lounge. (Don’t forget that you can transfer Chase Ultimate Rewards points to your Hyatt Gold Passport account or many other airline and hotel loyalty programs at a 1:1 ratio.) My brother-in-law and sister have Diamond status with Hyatt, while the rest of us had no status. The hotel still placed all of us in oceanfront rooms and we did opt for access to the Regency Club lounge. We enjoyed the expansive pool complex with two water slides, the beach, and its close proximity to the shops and restaurants in Lahaina. Even though my husband and I just got back from Maui a few short weeks ago, were already looking forward to our next trip to the islands. We’ll head to the Big Island before the year is out. This time around, my husband and I took advantage of one-way award bookings. We booked first class seats on Hawaiian Airlines flights. That set us back 80,000 Hawaiian Airlines HawaiianMiles and $10 for both tickets. We also cashed in 80,000 United MileagePlus miles and $10 to book two first class seats on US Airways flights that will get us back home. We were able to do this because you can use miles from any alliance member to book flights on other partner flights. In this case, United and US Airways are both part of Star Alliance so we used our United miles for US Airways flights. For our hotel stay, we cashed in thousands of Hilton HHonors points right before the program devaluation earlier this year to make reservations. We booked an oceanfront king room in the Ocean Tower of Hilton Waikoloa Village on the Kohala Coast. This premium redemption cost 44,969 points per night. Maintaining a portfolio of miles and points allows me to plan some pretty fantastic vacations that bring us closer together as a family. I hope over the years we can make a few more trips to the Hawaiian Islands with the help of miles and points.